Long-range shooting has become such a big trend that it’s almost not even a trend anymore. Whether shooting in competition, ringing steel at the range, or trying to stretch out a few more yards on an animal in a hunting scenario, everyone wants to be able to shoot just a little bit farther. Hot newer calibers (6.5 Creedmoor, anyone?) and better-than-ever manufacturing have allowed gunmakers to sell very capable long-range rifles at prices lower than you might have seen just a few years ago. Now, settle down. I’m not advocating for anyone to shoot deer or other game at unreasonable distances. And no, I’m not going to put a maximum number on how far is too far to be shooting game — it’s up to you to know your own abilities and work out your own ethics. But if you’re looking for a new deer rifle that can also do double duty on the range as a long-range target gun, here are five great options introduced at the 2018 SHOT Show. The big news from Savage this year is the introduction of the new AccuFit system on all model 110 series rifles. The AccuFit stock offers four LOP inserts and five comb risers to let you adjust the stock to your own perfect dimensions. The Long Range Hunter version of the popular Model 110 features that AccuFit system, a detachable box magazine, black carbon steel barrel and gray synthetic stock, soft-grip forend and pistol grip, a muzzle brake, and Savage’s superb AccuTrigger. You can get the 110 Long Range Hunter in .260 Rem, .300 WSM, .308 Win, .338 Federal, 6.5 Creedmoor, .300 Win Mag, 6.5x248 Norma, 7mm Rem Mag, .280 Ackley Improved, and .338 Lapua, all with 26-inch barrels. Total weight (unscoped) is 8 pounds in short-action calibers and 8.85 pounds in long-action calibers. You’ll find it on shelves well under a grand, with an MSRP of $1,099 ($1,299 for the Lapua). At 10.7 pounds, this new iteration of Ruger’s classic Hawkeye is decidedly more of a target gun than a carry-into-the-field hunting gun. But it’s a .300 Win Mag, which will pretty much handle any type of game you’d want to hunt outside of Africa, so it makes our list. The Long-Range Target version has all the features of a standard Hawkeye, including fixed-blade ejector, three-position safety, cold-hammer-forged barrel, integral scope mounts machined directly onto a sold steel receiver, and more. This version includes a 20 MOA Picatinny rail, five-round AR-style magazine, heavy-contour target barrel with muzzle brake, and a two-way adjustable comb that will help you get a perfect fit. It comes in speckled black/brown painted laminate with a 24-inch barrel with a 1:10 twist. Thus far, .300 Win Mag is your only caliber option. MSRP is $1,279. 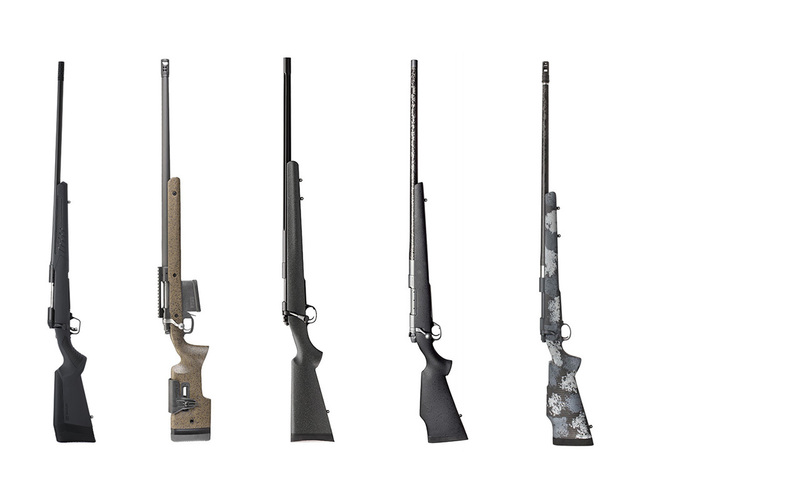 Kimber’s Open Range rifles feature heavy, fluted, steel barrels for accuracy. New for 2018 is the Open Country model with a Granite finish. It features a custom carbon fiber stock with pillar bedding for strength without excess weight, a textured gray finish for a little extra grip, full-length Mauser claw extractor for superior controlled round feeding and extraction, sub-MOA guarantee, adjustable trigger (factory set between 3 and 3 ½ pounds) and a threaded muzzle with thread protector. For now, it comes in 6.5 Creedmoor and .308 Win, at an MSRP of $2,269. The Weatherby Mark V needs no introduction, but the CarbonMark version is new for 2018 and definitely worth checking out. It was built for precision and comfort, with a custom-built carbon-fiber barrel that’s 64 percent lighter than traditional steel barrels. This gun has the nine-lug Mark V magnum action and Weatherby’s LXX trigger, a fluted bolt body, integral recoil lug, cocking indicator, and a sub-MOA guarantee. The stock has a slimmer forend and grip diameter for ergonomic comfort. The stock is also hand laminated and aluminum bedded with a matte gel coat finish. The 26-inch hand-lapped barrel features a gray Cerakote finish for durability and a threaded muzzle. The CarbonMark comes in .257 Wby Mag, 6.5-300 Wby Mag, and .300 Wby Mag, all weighing in at an easy-to-carry 7 ¾ pounds with a magazine capacity of 3+1. MSRP is $4,100. Nosler says the Model 48 Long Range has been “designed from the ground up with the serious hunter and target shooter in mind.” The action is machined from a solid piece of steel to provide a rigid platform for optimum accuracy. The match-grade, 26-inch Shilen stainless steel barrel is wrapped in carbon fiber to reduce the overall weight and dissipate heat better than traditional stainless steel. The carbon fiber stock uses aluminum pillars and a recoil pad to absorb recoil and retain zero in harsh conditions. Features include a Timney trigger, MOA guarantee, a hinged floorplate, two-position Rocker safety, threaded muzzle, optional muzzle brake, and more. All external metal surfaces are Cerakoted, and a textured finish gives you good grip in wet weather. Total weight of the gun (unscoped) is right at 7 pounds, with an overall length of 48 inches. Get it in 6.5 Creedmoor, .26 Nosler, .28 Nosler, .300 Win Mag, .30 Nosler and .33 Nosler for an MSRP of $2,995.